Edit 10/20/13: Two thirds of this trip is booked. See Getting Extra First Class on Cathay Pacific and Booking Singapore Suites. Lufthansa First Class will hopefully be booked in late February. The first three are surprisingly easy and cheap to piece together into one short trip around the world. I’ve been working on a few permutations for fun that I’ll share in this post. The main reason I haven’t flown any of these ultra-lux products before is that all the travel in my life has been focused on the destination, not on the accommodation, and East Asia hasn’t yet hit the top of my list. While I still want most of my travel going forward to focus on the destination, I’ve decided to treat myself to a few more luxury trips with miles after I enjoyed Emirates First Class so much. Plus East Asia has worked its way near the top of my list, since Asia is the place I’ve spent the least time. I want to combine Singapore Suites Class, Cathay Pacific First Class, and Lufthansa First Class out of Frankfurt into one trip. First class on Singapore A380s is called Suites Class. Tahsir flew Singapore Suites Class this year. What makes me want to fly it? A fully enclosed suite, over-the-top service, and the ability to combine two seats/beds into one double bed! Singapore Suites Class is impossible to get with United miles or US Airways miles, but it is pretty widely available to people with Singapore miles. Unfortunately Singapore awards will have fuel surcharges, though they are not crippling. Cathay Pacific First Class has a reputation for being a consistently excellent First Class, possibly the best in the world. I know everyone’s flown it, but my two transpacific routes in my lifetime were direct flights to and from Australia, so I haven’t had a chance. I’m especially interested in flying the newest iteration of the First Class, about to be rolled out across the 777 fleet. Cathay Pacific First Class is widely available on some routes, and on other routes, it’s scarce. But if you have enough flexibility, booking Cathay Pacific First Class is no problem. Lufthansa First Class gets high marks, and I am very interested in flying it. Furthermore I want to fly it out of Frankfurt to enjoy access to the First Class Terminal Tahsir visited this year. Lufthansa First Class is widely available to people with United miles less than 15 days before departure. Before 15 days before departure, you’d need Lufthansa miles. There are a lot of options to combine all three onto one itinerary. You can fly around the world to the east or west with as few as three segments or several more. You can start in Los Angeles, San Francisco, Chicago, New York, or connect to one of those cities. Lufthansa has tons of routes from Frankfurt to North America. The most useful for this exercise are to New York-JFK, San Francisco, Los Angeles, Chicago, and Vancouver, which are cities that either Singapore or Cathay Pacific also serve. Singapore flies its Singapore <-> Los Angeles (via NRT) and New York <-> Singapore (via FRA). The flights are so long that they have a stop en route, and you can book either half of the flight instead of the whole thing to save miles or make routing better. There are a lot of ways to cram Singapore Suites Class, Cathay First Class, and Lufthansa First Class out of Frankfurt onto one trip. There is only one way to do the trip with only three takeoffs: New York to Frankfurt to Hong Kong to New York, flying Singapore, Lufthansa, and Cathay Pacific in that order. I think this is also the shortest amount of flying possible to meet the goals. In addition this would be the cheapest routing in miles. Frankfurt to Hong Kong would cost 80,000 United miles + $181.20 including a $75 fee for booking the award within 21 days of departure, which you’d have to do since United only gets access to Lufthansa First Class space 15 days before departure. If you have status, the $75 fee is reduced or eliminated. Cathay Pacific First Class from Hong Kong to New York-JFK would cost 67,500 American miles plus about $58 including a $25 phone ticketing fee since Cathay Pacific awards are not bookable online. In total, the goals could be accomplished for 80k United, 67.5k American, 58k Membership Rewards, and $458. I strongly prefer to travel west because I’m a night owl, so it’s easier for me to adjust heading west. Plus traveling west on this itinerary would mean more flying time, which I would prefer since this trip would be all about the flying. There are several options flying west. One I’ll highlight includes testing out Singapore Suites Class and its “normal” First Class on the 777. This award would begin in Los Angeles and fly the direct Cathay Pacific flight from Los Angeles to Hong Kong for 67,500 American Airlines miles and $27.50. Then you would fly Hong Kong to Singapore in First Class on a 777. 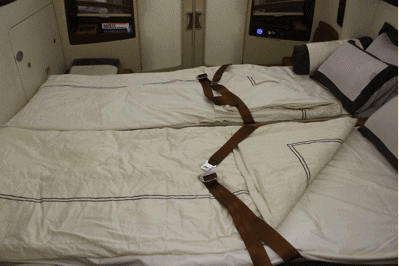 After a brief layover in Singapore, you would continue from Singapore to Europe in Suites Class on an A380. On the map above, I have the flight into Paris, but it could go to London, Frankfurt, or Zurich just as easily. The total cost of the Singapore award would be 104,125 miles plus about $272. The last leg from Paris or Frankfurt to Los Angeles would be 67,500 United miles plus about $200 out of pocket. The total cost of going west on this route would be 105k Membership Rewards, 67,500 United miles, 67,500 American miles, and $500. The big difference here is the surge in the amount of Membership Rewards required for the trip compared to the last option. In return, you’ll get to try Singapore First Class for 3hr45min in addition to five extra hours in Suites Class. The Singapore Suites and First award was more expensive than it had to be to meet the stated goals of this exercise because it flew Hong Kong to Singapore in Singapore First Class, which added to the number of Singapore miles needed. We can cut costs by including Hong Kong to Singapore in Cathay Pacific business class for no extra miles on our Cathay Pacific awards. Under this scenario, Chicago to Hong Kong to Singapore is 67,500 American Airlines miles and $50 with Chicago to Hong Kong in Cathay Pacific First Class. Singapore to Frankfurt is 91,375 Singapore miles and $247. Frankfurt to Chicago in Lufthansa First Class is 67,500 United miles and $200. Add it up and removing the extra leg in Singapore First Class and replacing it with Cathay Pacific (regional) Business Class saves 13,000 Membership Rewards, but otherwise basically costs the same as the last award from Los Angeles West. Total cost: 92,000 Membership Rewards, 67,500 American miles, 67,500 United miles, and about $500. Remember how that Los Angeles to Singapore flight has an intermediate stop in Tokyo? If we get off there, we can save 19,000 Singapore miles. The route can continue in Cathay Pacific First Class from Tokyo to Hong Kong to Frankfurt. Finally we can return in Lufthansa First Class from Frankfurt to Los Angeles. This award would cost 75k Membership Rewards, 70k American Airlines miles, 67,500 United miles, and about $400 because the Singapore flight only has about a $140 surcharge. I decided to make a chart of the four options for easy comparison. Each of the four trips in this post are listed by the name I gave them. If you value your miles at exactly the same rate that I value them on my Mile Value Leaderboard, and you value every hour of Singapore Suites, Singapore First, Cathay First, and Lufthansa First equally, then the last column would tell you the highest value award. A bigger number of miles flown per $ of value spent is better. Of course, everyone should value their miles slightly differently based on a lot of personal factors and tastes, and more importantly not every mile flown in First Class has the same value. For instance, I want to fly each of these products for a solid eight hours. More would be better, but eight will give me a good taste of the product, so anything over eight is gravy that I value a lot less than the first eight hours. For this reason and similar reasons, even after looking at the miles flown per dollar column, my top two choices would be Three Takeoffs for its simplicity and fewest miles used and Singapore Transpacific at a Discount for its westward direction and nearly equal amount of time in each cabin. As I’ve hinted, the best way to get the Singapore KrisFlyer miles needed for this award is through its transfer partners: Membership Rewards and SPG Starpoints. Both points transfer 1:1 to Singapore miles, with SPG points enjoying their standard 5k mile bonus for every 20k points transferred. The two best cards to earn Singapore miles are both Membership Rewards earning cards because of their higher sign up bonuses. Mercedes-Benz American Express Platinum with 50k Membership Rewards after spending $3k in three months. This card has a $475 annual fee, but I think the benefits far outweigh the fee if used correctly. Business Gold Card from American Express Open with 50k Membership Rewards after spending $5k in three months. The $175 annual fee is waived the first year. The best way to earn American Airlines miles are the current 86,000 mile combo of the personal and business card. Citi® Platinum Select® / AAdvantage® World MasterCard® with 40,000 American Airlines miles after spending $3k in three months. The $95 annual fee is waived the first year. Citi Business AAdvantage Card with 40,000 American Airlines miles after spending $3k in three months. The $95 annual fee is waived the first year. The best way to earn United miles is a United MileagePlus Explorer Card from your local branch and an Ink Bold. There is a MileagePlus Explorer Card offer for 50k United miles after $2k in spending in three months at Chase bank branches according to multiple sources. The Ink Bold (business charge card) with 60k bonus Ultimate Rewards after spending $5k in the first three months. The $95 annual fee is waived the first year. Ultimate Rewards transfer 1:1 to United miles. The way I plan to book the awards is to find the Cathay Pacific and Singapore awards that fit together well in my desired time frame. The Lufthansa award will be booked with United miles in the last 15 days before departure, so I’ll give myself several days of flexibility for that segment and check in advance that it is a route that commonly releases Lufthansa award space. I’ll search Cathay Pacific award space on ba.com and then call AA at 800-882-8880 to book the space I find. I’ll search and book Singapore award space on singapore.com. I’ll search the Lufthansa route I’m considering now and book the award space in the last 15 days by searching and booking at united.com. I want to combine three First Class experiences on a Singapore A380, on a Cathay Pacific 777, and at the Lufthansa First Class Terminal into one incredible trip. I’ve analyzed all the options, and I’m ready to book whatever fits my schedule better and has the award space. The number of miles needed to do the same trip is available to anyone who opens a few credit cards or has miles sitting around from flying. This lets you fly LH first class two times and gives you access to the FCT. It’s also 10K miles less than doing Europe to Asia. The “trick” is to have them manually price it over the phone if it doesnt work. LH will release 2 F seats within the 14 day period if aren’t many paid fares and the cabin is pretty empty. Search on ExpertFlyer.com (under fare availability) for the LH flight you want to take and see the fare buckets F and A (First and Discounted First). If you are looking at a flight fifteen days out that is F8, you have a good chance that LH will release one seat. If the route isn’t a flagship one (e.g. LAX/SFO/MIA/JFK-FRA), LH will likely (but not always) release an F seat at the T-14 mark. Routes that are generally very easy are YVR-MUC, SEA-FRA, and DTW-FRA. If the fare buckets continue to have F8 or F7, then it’s likely that LH may release another seat a few days out. No guarantees on the second seat though and definitely no guarantee on LH releasing a seat either at T-14! It’s just a lot of checking award space and just praying the LH gods will release a seat. I don’t get it.. the Singapore Suites class all the way from JFK to FRA is just 67500 miles, whereas a simple business class on Singapore from CCU to SIN is a whopping 65000 miles..!!!!!! Am I doing something wrong here..??? It’s actually only 57k and change after the 15% online discount. I don’t ask why there are sweet spots on the chart, I just enjoy them. Yeah I know it’s 57k and change.. I was referring to the miles requirement before th 15% discount.. my point remains the same.. Now I am wondering how do I fly my parents from CCU to SIN without feeling like i am throwing away miles..!! Another variable to consider is ability to add on another F class flight from a N America Gateway if you used CX booked with AA miles to LAX/SFO/YVR/ORD/JFK . Steve, I once got away with HKG-ORD-NYC-YVR-LAX all on one award. ALSO, HKG-ORD & JFK-YVR were cathay first lol. Prefer 1st or BUS – with the cruise in between. Thought about going on from SIN to Bali as a possibility or any other interesting location – your thoughts ? 1. What airlines should we be considering using our miles for travel, for either SIN- HKG or HKG-SIN , without the SIN to Bali as a possibility – CX or SQ or other ??? 2. For only the HKG-SIN cruise with SIN to Bali as a possible onward flight — What airlines should we be considering using our miles for travel to & from FL ??? If you do fly HKG-SIN, you should try to take a stop in BKK. You can then fly the a380 for 17,500 in business or 30K in first. If not, the flight is only 2 hours and Singapore runs all regional jets between the two cities except for one flight that is 777-300er which isn’t available ever. You should head to Phuket or Krabi from Singapore. If you like that beach vibe, both places offer tremendous value with hotels and overall pricing! I have SQ Suites booked for early next year. Still haven’t made other plans, but I might get Qantas F, CX F, and Lufthansa F on the returns. Does anyone have tips for finding 2 suite class spots on the same flight? Preferably on a flight that ends up in Asia. I too would be interested in your advice for destinations ex-NYC that have 2 SQ suites available. FRA is one, I take it. So effectively, you spent over $21k USD within 3 months to offset all those sign up bonuses? What did you spent it on? Personal business?